IP65 rated case with brackets for surface mounting or one or two sided pole mounting or ceiling suspension. 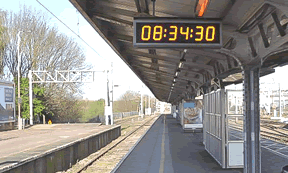 Time, time and date or optional time and temperature display. 110-230V AC, 12 or 24V DC options. N and NE versions have 10/100Base-t Ethernet NTP with PoE. E and NE versions stand-alone or synchronised operation. E and NE versions have stopwatch & count-down functionality. IR handset for set-up and stopwatch control. 1166 x 370 x 123mm 45.9" x 14.6" x 4.8"
960 x 370 x 123mm 37.8" x 14.6" x 4.8"